Calling all Hong Kong Digerati and cartoon lovers! Due to the public holiday on July 1st (Hong Kong Handover Anniversary), we'll be moving Web Wednesday to THURSDAY 2nd July. 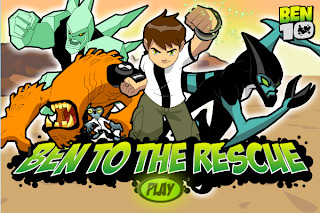 Topic: "Ben 10: creating a new multimedia cartoon empire", interview with Benjamin Grubbs, Regional Head of Interactive Media for Turner Entertainment Networks Asia (owners of Cartoon Network Asia). We'll be talking about online gaming, new forms of interactive education, user-generated cartoons, virtual merchandise and creative ways for content owners to work with advertisers online. The night kicks off at 6:30pm and ends around 9:30pm, so you'll have plenty of opportunity to mix with the movers and shakers of our local Internet and global entertainment industries. There will be an entrance fee of HK$100, unless you're a bona-fide student, in which case it's HK$50. This includes one complimentary drink. All other drinks are at Happy Hour prices. (We will issue a receipt, if you require one). In fitting with the theme, we will donate 10% of entrance fees to a children's charity. Do invite fellow Generation Z marketeers to join the Asian Digerati on Thursday 2nd July at Volar Bar & Club, Basement, 38-44 D'Aguilar Street, Lan Kwai Fong, Central, Hong Kong. Sign up for the event on Facebook or on this blog. After two years of building a buzzing community of English-speaking Digerati who meet monthly for "Web Wednesday", I'm proud to announce our venture into the local creative community with a new spin-off event in Cantonese. "First2Forward" is a fun idea that came from Brent Horner, Associate Creative Director of MRM Worldwide. (I kowtow to his fluent "Pak Hwa"!). First2Forward is a fast-paced game show. Two top creative directors, battling it out over five rounds of competition. One event that reveals the freshest, funniest, and freakin' coolest stuff from around the Web. View more Microsoft Word documents from Napoleon Biggs. 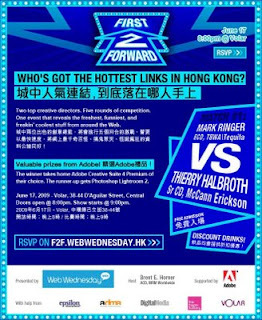 Join us the third Wednesday of every month to find out who's got the hottest links in Hong Kong. Match #1 features Thierry Halbroth, Sr CD, McCann Erickson Vs. Mark Ringer, ECD, TBWA\Tequila and will be held on June 17th at Volar, starting at 8pm (creative types like to go out later!). Sign up on Facebook. (Below is the email we sent out to the Web Wednesday members as well as the HK4As member list). I'd like to thank Adobe for their support and for providing their creative suite of design tools as valuable prizes: Adobe Creative Suite 4 Premium and Photoshop Lightroom 2. Great prizes from Adobe! To commemorate the 20th anniversary of Tiananamen on June 4th, we will be donating 10% of the collected entrance fees from tonight's Web Wednesday social mixer to "Home Coming - 回家 ", a movement to bring Tiananmen exiles back to their home country, China. You can also donate directly here.